Budding bibliophile, gastronomically inquisitive, late twenties. Presently living in Melbourne. Fond of rambling (in words and on foot). It can be easy to miss this small café when walking along the busy thoroughfare that is Lonsdale Street, nestled as it is between the commercial behemoths of Melbourne Central and Emporium. Several passers-by, attention caught by yours truly taking pictures from the outside, professed surprise at its existence, as they apparently had walked past it many times without noticing. 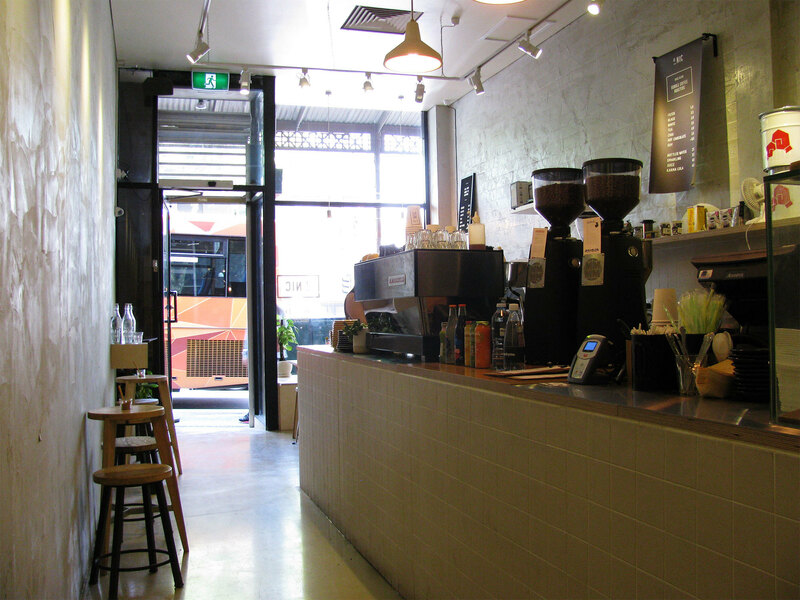 The interior is very cosy. 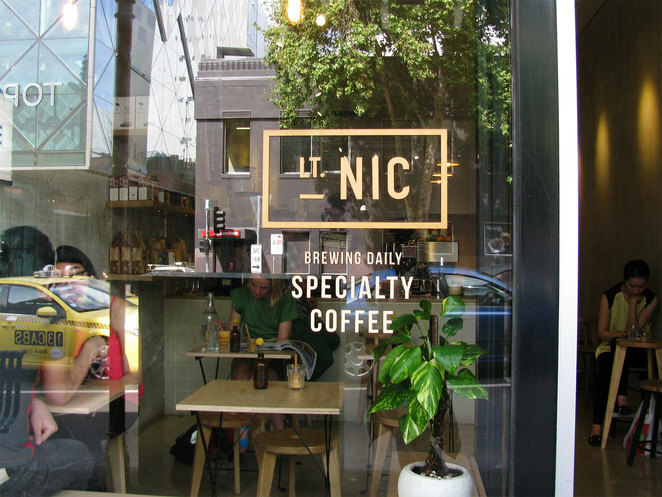 The seating is quite limited and mostly located near the front, where diners get the benefit of natural sunlight and a good view through the floor-to-ceiling window in order to people-watch the pavement outside. Display cases show the baked goods on offer for the day. 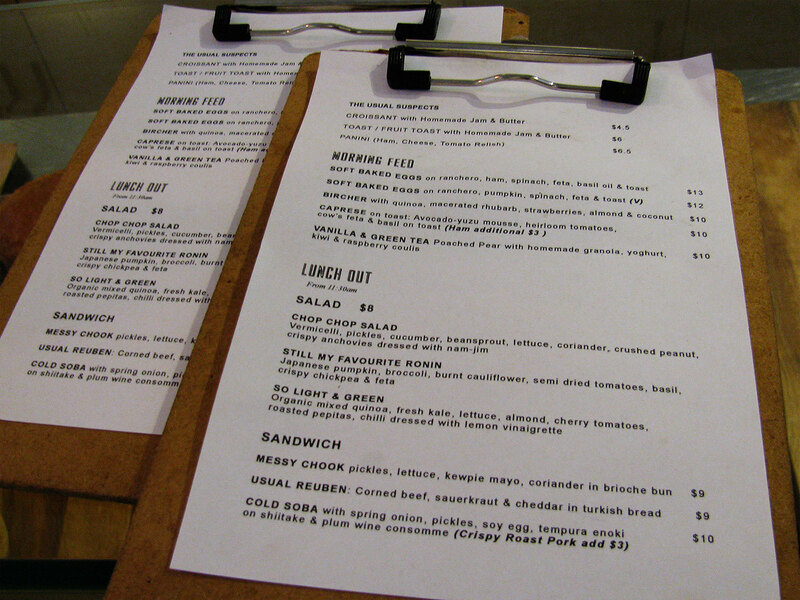 The menu itself is small, but I found the choices fairly affordable for a café in the CBD. My only quibble is that the inside grew quite warm after a while, as my visit was on an especially warm day during spring. It might be that they simply hadn't gotten around to setting up fans because the weather that week had been otherwise mildly cool. 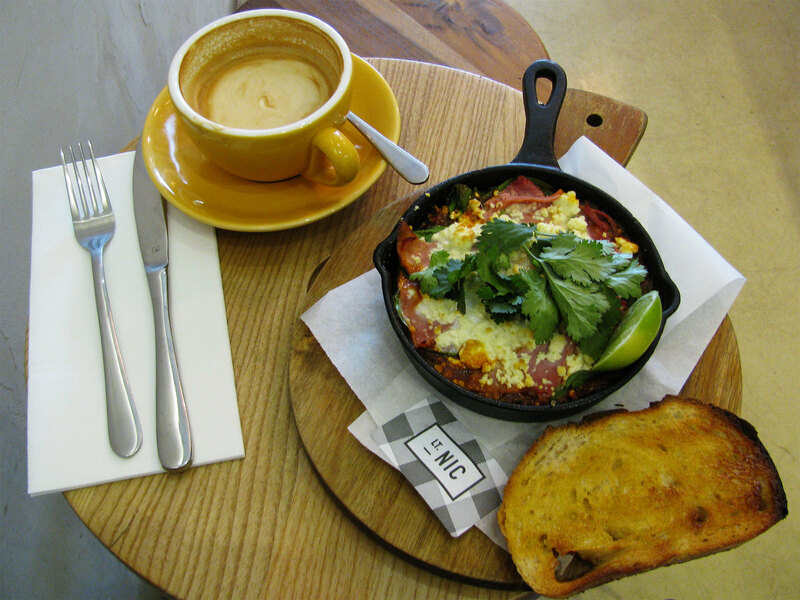 I ended up ordering the soft-baked eggs on ranchero, ham, spinach, feta and basil oil, plus toast. It was delicious; the eggs were cooked perfectly, and the ranchero-style sauce was nicely spicy without drowning out all the other flavours. (That said, I would advise those unused to spicy food to proceed with caution. My own tolerance comes from years of eating Mexican food in California.) The coffee was similarly pleasant, not too bitter or heavy. This is definitely a good place to pop in for some restorative caffeine and maybe a small meal. It's quiet enough that friends or coworkers can converse with ease. Or someone in need of a breather in the middle of a busy day can enjoy the relaxed atmosphere and friendly staff. Consider a visit if you happen to be in the area!